Carl F. H. Henry has been called "the Dean of evangelical theologians," and "the premier theological representative of the evangelical movement in the last half of the twentieth century." When his magnum opus, God, Revelation, and Authority, first appeared, it was hailed as "the most important work of evangelical theology in modern times." 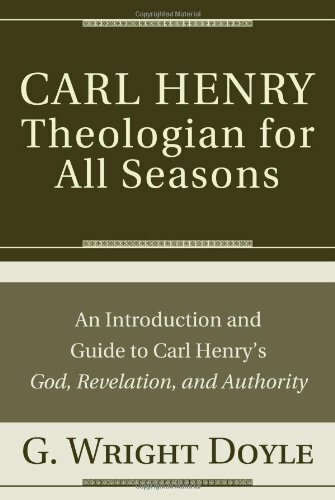 Carl Henry: Theologian for All Seasons not only introduces contemporary readers to Carl Henry the man, but also demonstrates that his theology possesses striking relevance for our own situation. We are introduced to his place in the complex mosaic of twentieth century theology, his simple but sophisticated doctrine of revelation, and his value for current discussions of a wide variety of issues. Henry's reflections on hermeneutics, philosophy, and faith; the nature of revelation and of God; the social implications of Christianity; and many other vital topics, turn out to be as pertinent now as when they were written. Not everyone agrees with Carl Henry's approach, of course, so this book features an extensive dialogue between Henry and his critics, making the case that his thought has been incorrectly described as outmoded and that he offers clear guidance for twenty-first century thinkers. To make the wealth of material on the many topics in God, Revelation, and Authority more accessible, the book includes a theological index, a macro index, and detailed outline of the entire six volumes.